“Merry Christmas”. On the 3rd December 1992, Neil Papworth sent this message over the GSM network to Richard Jarvis of Vodafone, this was the first text message sent to a mobile device. Welcome to the age of messaging. Irish company Aldiscon launched the first commercial SMS in 1993 with some 8.53 trillion text messages now sent per year. Roll forward to 1997 the then tech giant America On Line (AOL) launched AOL Instant Messenger and were soon followed by Yahoo! and Microsoft, (oh, where have AOL and Yahoo gone!). AOL went on to dominate the market with some 53 million users. By 2007 Apple had launched the iPhone and “over the top” messaging services became pervasive through the ubiquitous iMessage service. Today in 2018 we have some 24 different messaging apps available. The combined total monthly active user (MAU) count for the top four messaging apps (Facebook Messenger, WhatsApp, WeChat and Viber) has grown to 4.1 billion, with the top three messaging apps touting user bases of 1 billion or more1. That’s more than half of the world’s population! Messaging is not only a rapidly growing channel but in itself it is multi-channel. 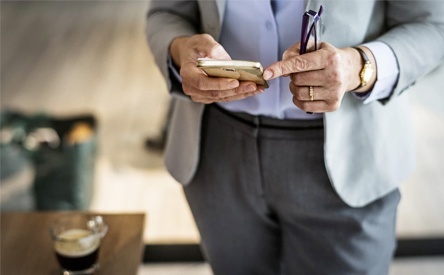 Not only must you support messaging as a channel, but you must give customers the choice of connecting to you via the messaging app of their choice. Furthermore, you need to consider how you can consolidate interactions from these multiple apps into a single view. Given the sheer volume of interactions and potential usage form your customer base, you need to consider how to streamline and automate where appropriate. However, you need to avoid the temptation of replicating the approach you have on your voice channel and in particular not falling into the trap of building “chatbot hell” to replicate the current implementations of “IVR hell”, which is a blight on the customer service offering of many large and small organisations. For your customers we enable communication via ANY APP – start the conversation on one app and seamlessly pick-up again on another. For you, we collapse all of these interactions into a single platform. Syndeo’s unique BLENDED AI technology guides your customer using the best combination of self -service and assisted-service at every step of their journey. Our AI engine is built specifically for customer experience interactions. With Syndeo you can deploy automation and new experiences in a matter of hours and totally CODE-FREE. You can rapidly adjust to meet the evolving needs of your organisation and your customers. No need for specialist skills. At a recent webinar, we demonstrated some of the features of our platform. You can see a recording of the short 10-minute demo here.